The Fruit Deck is probably the one of the best delivery services we've come across. They deliver fresh fruit by the kilo (you need a minimum of three kilos to place an order) straight to your doorstep—and not just fruit available in the market, imported fruit, dried fruit, dates and fresh dry fruit cookies too. Vast selection of fruits, same day delivery (as long as it's before 12 pm). That they've got all sorts of fruit, which includes produce that's available in the market at lower rates than your regular fruit guy or supermarket. 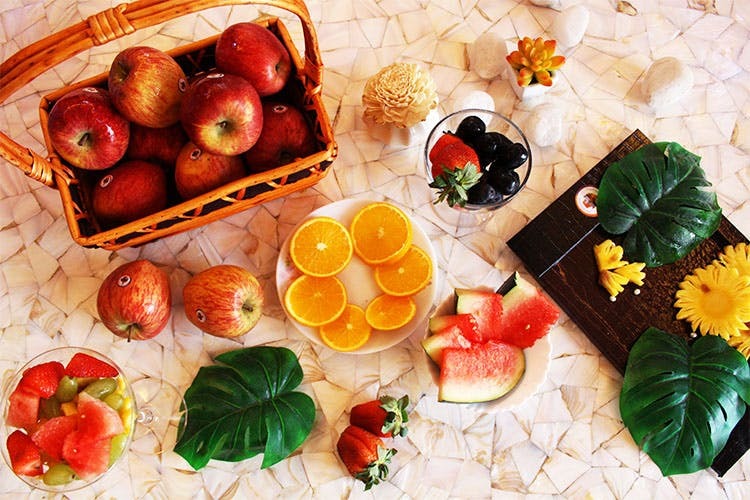 What's really impressive is their range of imported fruits— they've got various kinds of frozen berries, Vietnamese mandarin, mini oranges from Thailand, kiwi from New Zealand, cherries from Uzbekistan and more. Also, all the fruits come fresh because they're delivered in refrigerated vans.They're also nice enough to deliver cut pineapple to you, plus banana chips, dates and freshly baked dry fruit cookies. They'll send you a text every morning with details of the fruit available with the prices for that particular day (which is a nice reminder to eat or order your fruit). It's an ideal service if you live alone—just get your fruit delivered to your home or office. Just text them on Whatsapp on +9185888 89588 to place your order, or get in touch via Instagram. They're only delivering in Delhi right now, but they'll soon start delivering all over NCR.